The Every Member Campaign is the AFP Foundation for Philanthropy Canada’s annual campaign to raise the profile of the fundraising profession by creating sector advocates through education, building philanthropic leaders through scholarships, strengthening the sector through career mentoring and fostering a better understanding of our profession though research. Your support makes a difference. 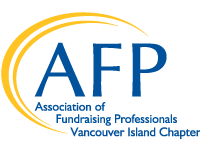 Your generous gift to the Every Member Campaign enable us – the Vancouver Island Chapter – and the AFP Foundation for Philanthropy Canada, to raise the profile of the fundraising profession and support AFP members in their careers as professional and ethical fundraisers. Donations made by members of our chapter have a direct benefit for fundraisers on Vancouver Island and within our communities. This year, we again have the potential to receive a grant of 35% of our fundraising efforts returned to our chapter in support of local programming. Making your 2018 gift, or pledging your support, is easy. Donate online today through our secured site or complete and return the 2018 donation form. As fundraisers, we all know the value of monthly supporters. Commitments, whether they are monthly, quarterly or semi-annual, fund important initiatives, reduce costs and most importantly allow for maximum impact. As an Alpha Society member, manageable contributions can allow you the flexibility to make a significant donation over the course of the year. Your gift, regardless of size, makes a tremendous impact – thank you for your support!